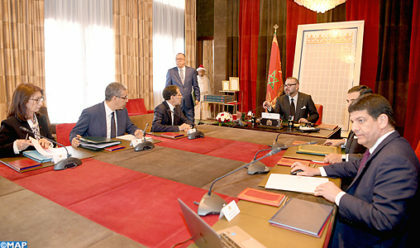 King Mohammed VI chaired, Thursday at the Royal Palace in Rabat, a working session to review the progress in renewable energy projects led by MASEN, said a statement by the Royal Office. During the meeting, attended by ministers and senior officials, the King was briefed on the progress made towards achieving the goal of generating 52% of Morocco’s energy mix from renewable energy. The Royal Office statement said that the King expressed satisfaction with the progress made to date on all components of the national renewable energy plan and gave his instructions to maintain and strengthen this momentum with a view to making this sector a genuine economic engine. Noor Ouarzazate II and IV, will be operational in May 2018, while Noor Ouarzazate III will be operational in October, which will make it possible to finalize the Ouarzazate integrated solar complex in accordance with the initial commitments, the statement said. Noor Laayoune I and Noor Boujdour I will be operational in June this year, it said. The King also followed detailed explanations on the Noor PV II project, with a capacity of more than 800 MW, which will be implemented in several regions across the kingdom (Laayoune, Boujdour, Taroudant, Kelaa des Sraghna, Khouribga, Lhajeb, Guercif, Sidi Bennour and Jerada), as a complement to the large integrated solar complexes in order to optimize the national technological mix and contribute to broader territorial development.